"I modified my mother's chicken and sausage gumbo recipe to make it gluten-free. Good gumbo is hard to find for my friend with a wheat allergy. The wheat flour roux is the key ingredient for any gumbo. After experimenting with a few gluten-free alternatives, I find that a light brown millet flour roux thickens the gumbo and gives an excellent taste nearly equal to wheat flour. Most people won't notice the difference." Place chicken in a 6- to 8-quart stockpot and pour in enough water to completely cover the chicken; bring to a boil, reduce heat to medium, and simmer until chicken is no longer pink at the bone and juices run clear, about 1 hour. An instant-read thermometer inserted into the thickest part of the thigh, near the bone should read 165 degrees F (74 degrees C). Remove chicken from water and place on a work surface to cool, retaining the resulting chicken stock in the stockpot. Cook and stir millet flour and vegetable oil together in a large frying pan or skillet over medium heat until roux is smooth and slightly darker than peanut butter, about 10 minutes. Mix onion, green bell pepper, and garlic into roux; cook and stir over low heat until fragrant, 2 to 3 minutes. Transfer onion-roux mixture to stockpot with chicken stock. Bring chicken stock mixture to a simmer over medium heat; add andouille sausage, celery, green onion, bay leaves, salt, thyme, and cayenne pepper and simmer for 1 hour. Remove skin from cooked chicken and discard. Pull meat from the bones and chop into bite-size pieces; discard carcass. Add chicken meat to broth mixture and simmer until chicken is heated through, 5 to 10 minutes. Remove stockpot from heat, stir file powder into gumbo, and remove and discard bay leaves. The resulting gluten-free roux is not as thick and dark as the typical chocolate roux used in gumbo. 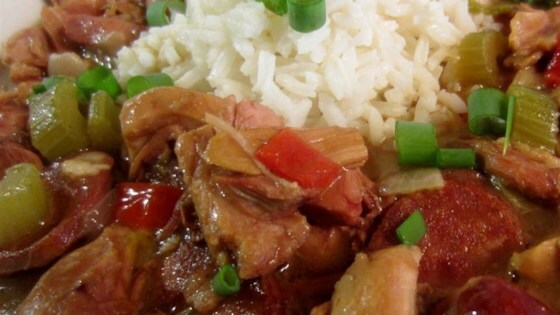 The gumbo should be served over steamed rice that has salt and butter added to taste. It is delicious immediately, but is even better reheated the next day. Delicious and easy! Used turkey sausage and quinoa instead of white rice. Very flavorful - will definitely make again! I chose this recipe because it seemed simple enough. The roux took 40 minutes of stirring not 10 min. I think it needs to be spiced up. But otherwise it is a good basic recipe.